Lesson 1: Why back up? You can lose your irreplaceable files FOREVER! You should be COMPULSIVE about backing up! 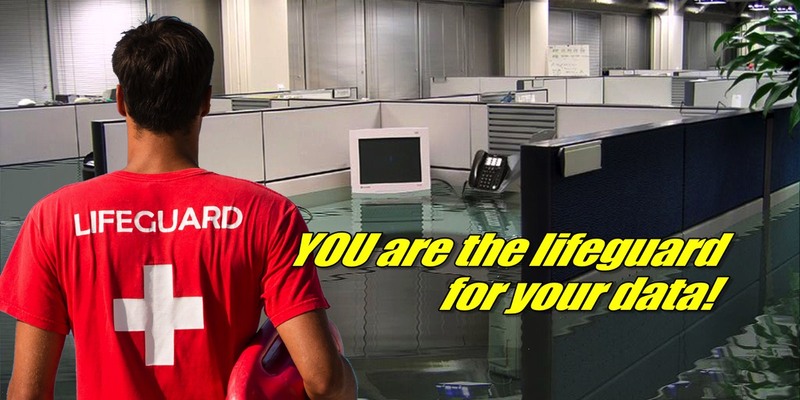 Some people don’t take backup seriously because they assume data loss won’t happen to them. 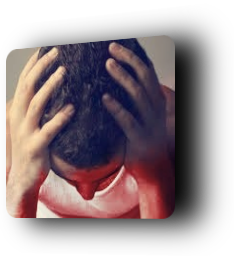 Unfortunately, several TekBasics clients have experienced unnecessary heartache, grief, and expense because they didn’t back up. If your files are important to you then an effective backup strategy is mandatory. 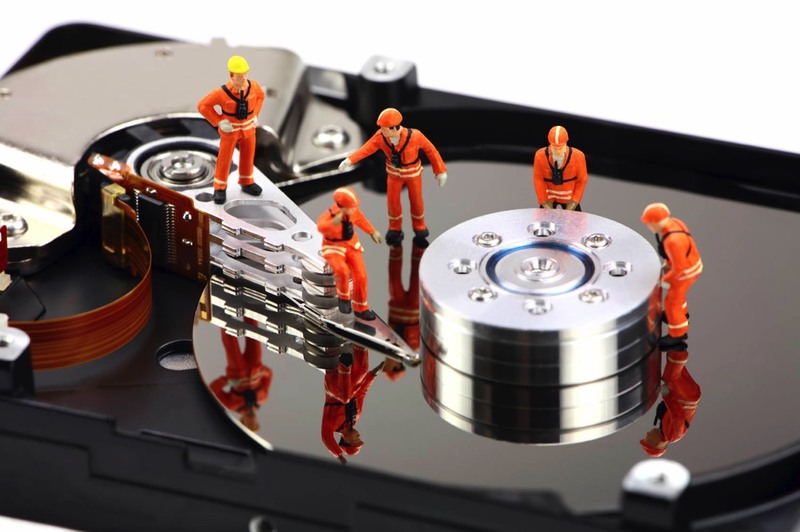 Setting up your backup strategy is the most important service we offer. Expect that your disk will fail any minute, even if it’s brand new! The disk may be covered under warranty but your files aren’t. Your computer’s disk storage device is a fragile mechanism. It can malfunction during normal operation. Your files can become corrupted so that the operating system can’t read them. 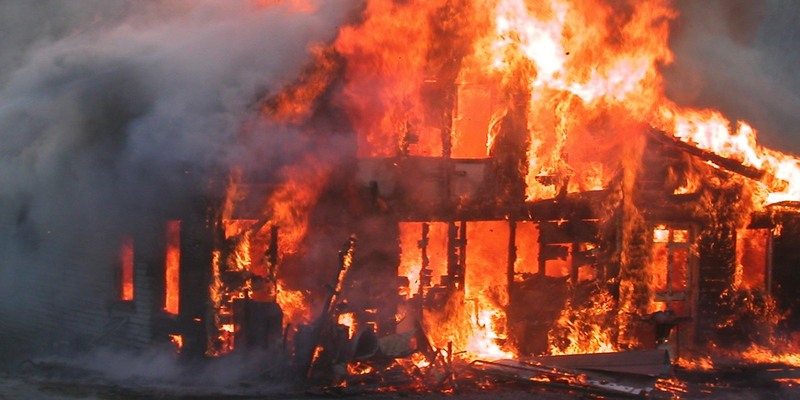 External factors such as a sharp impact, an electrical surge, high magnetic waves, exposure to liquid or other environmental contamination can lead to a failure. It’s not a question of IF your disk will fail… it’s a question of WHEN. A hard disk is a mechanical device that will eventually fail. 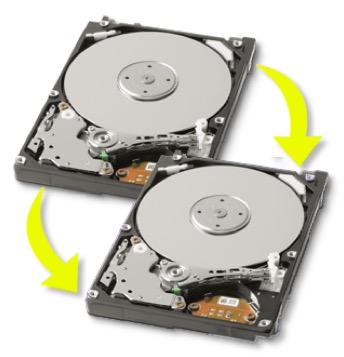 Many hard disks fail because of worn out parts. Wikipedia.org has detailed information on hard disk failure here. Solid state devices (SSD) also fail due to electrical surges, exposure to environmental contamination such as liquids, and data corruption. delicate, complex and often require microsurgery… and it can cost thousands of dollars and take a week or longer! 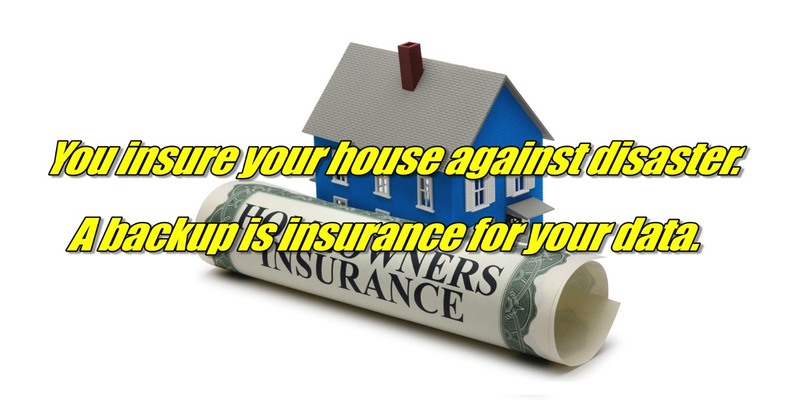 (Call them at 800-440-1904 and ask about their rates.) 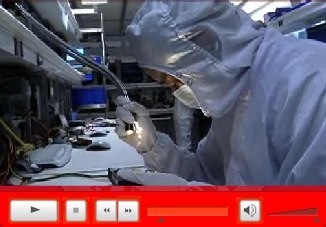 The situation is worse with solid state storage devices because almost all data recovery services cannot work on them. An effective backup plan will prevent you from becoming their client. View this YouTube video tour to see for yourself what you want to avoid. 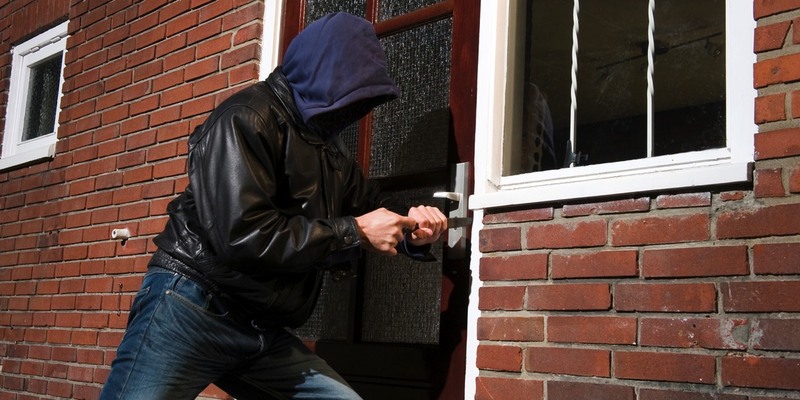 Your files can also disappear due to theft, fire, and storm damage such as lightning or flood. No need to worry if you have an effective backup plan. 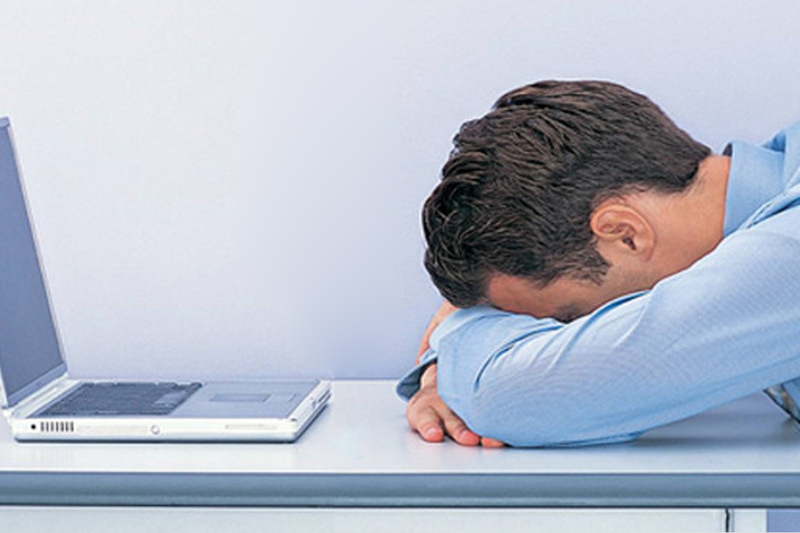 Have you ever accidentally changed or deleted an important file? TekBasics can set up a Versioned Backup system that automatically copies the latest version of your files into your backup archive. With a Versioned Backup archive you can ‘go back in time’ and retrieve the earlier version of the file you need from the archive, as it was before you deleted it or made changes. 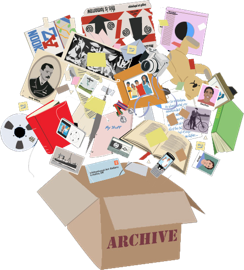 We can set up your archive on a hard disk attached to your Mac, or it can be wireless. We can even set up your Versioned Backup archive so that it will automatically back up to online servers so your files are stored safely offsite. A Versioned Backup can also be used to rebuild a failed disk, but this process can take hours or days. 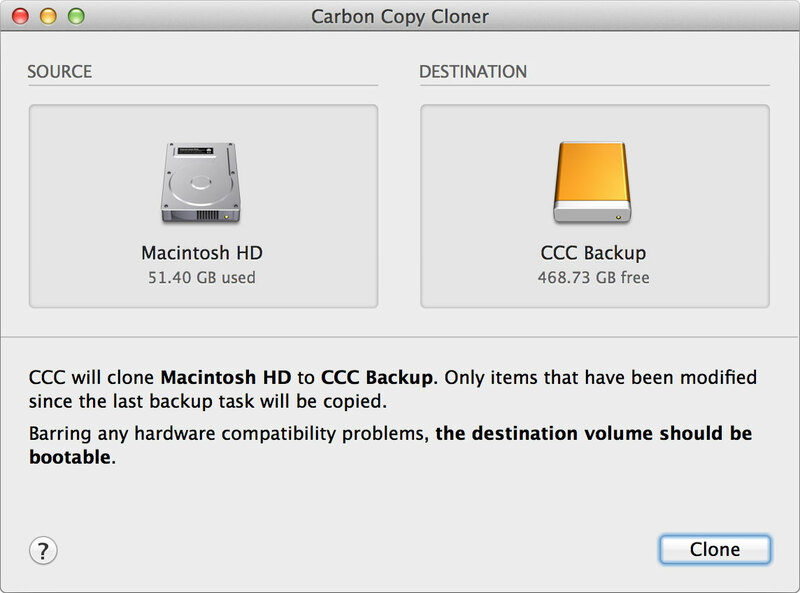 If you can’t be without your computer that long TekBasics recommends that you also have a Duplicate Backupa duplicate of your hard disk. When your hard disk fails you can restart your Mac from the Duplicate Backup and you’ll be up and running again in minutes. Lesson 2: Will your disk fail? Once you understand these Dirty Little Secrets of how a hard disk operates, you’ll wonder why you ever put your data on it. It’s an amazing invention, but it’s a delicate mechanism and there are many points of failure. If you want detailed information beyond what’s explained on this page, go to wikipedia.org here and here. 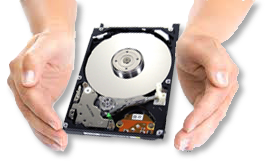 Hard disk enclosures have round metal platters inside that spin at very high speeds (usually 5400 to 7200 revolutions per minute). The platter is covered with a magnetic coating. There is a read/write head attached to an arm that pushes the head across the platter in tiny increments. Electronic signals sent to the head cause magnetic impulses to be recorded to the magnetic coating. Your files live inside the magnetic coating on the surface of the platter. The head and the arm are extremely lightweight so they can float on a cushion of air and not touch the surface of the platter as it spins. 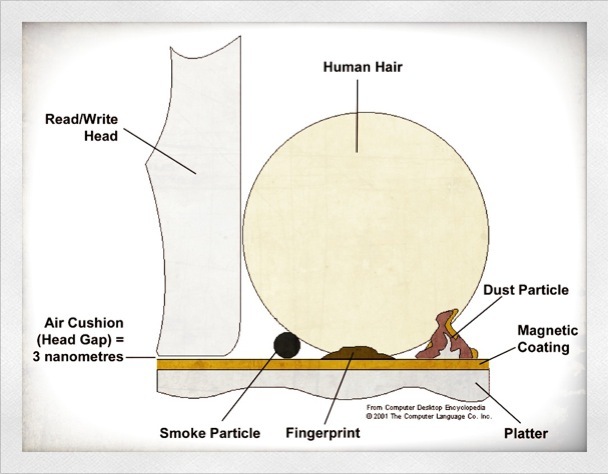 If the head comes into contact with the platter, the head will scrape the platter surface and damage the magnetic coating on the platter surface. That’s called a head crash or a hard disk crash. 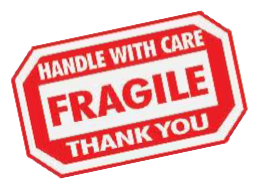 It is very easy for bad things to happen to this fragile mechanism. sealed, air enters through a filter and if debris such as a smoke particle or dust particle gets past the filter it can get jammed between the head and the surface of the platter, causing the head to make contact with the platter and the result is a head crash. 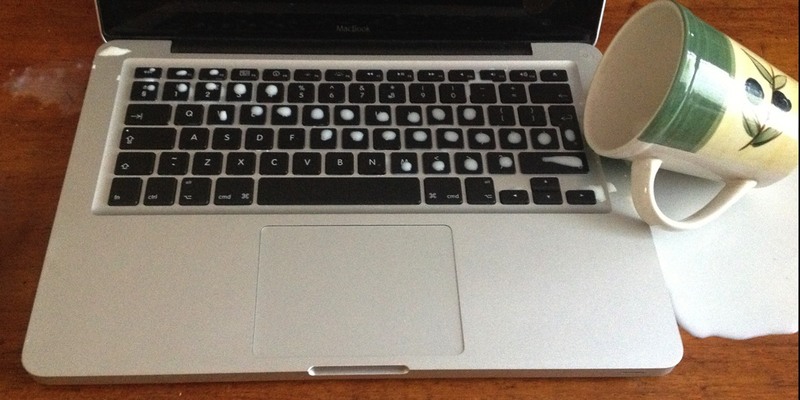 It’s amazing that a hard disk works at all when you understand how tiny that cushion of air is! When the hard disk is powered down the actuator arm is supposed to retract, parking the head safely away from the platter. Sometimes parking doesn’t happen properly and the head comes into contact with the platter. If the hard disk is jarred suddenly while it is operating, the head can bounce and come into contact with the platter, causing a head crash. 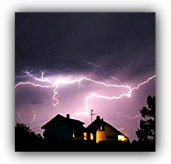 A sudden surge in electrical power such as a lightning strike or a power interruption can cause an unpredictable movement of the head. These power fluctuations can also cause the head to write the wrong information. 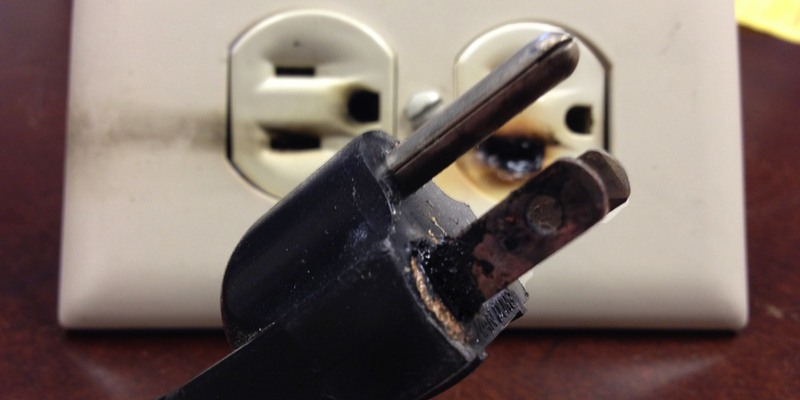 A uniform power supply (UPS) can help eliminate these problems. 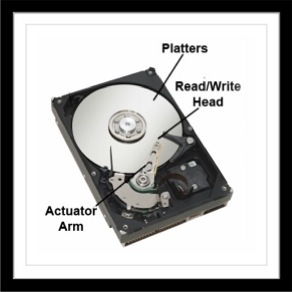 A motor inside the disk enclosure spins the platter on a spindle with ball bearings. 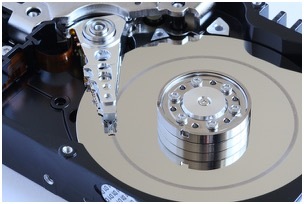 Electric motors and ball bearings wear out, causing the hard disk to fail. The circuit board inside the disk enclosure may fail, making the disk mechanism inoperable. Some magnetic areas of the platter may become faulty. Although these bad sectors may not cause a head crash, they can cause data loss and can indicate that failure is imminent. What about solid state devices? But solid state storage devices are not failsafe. 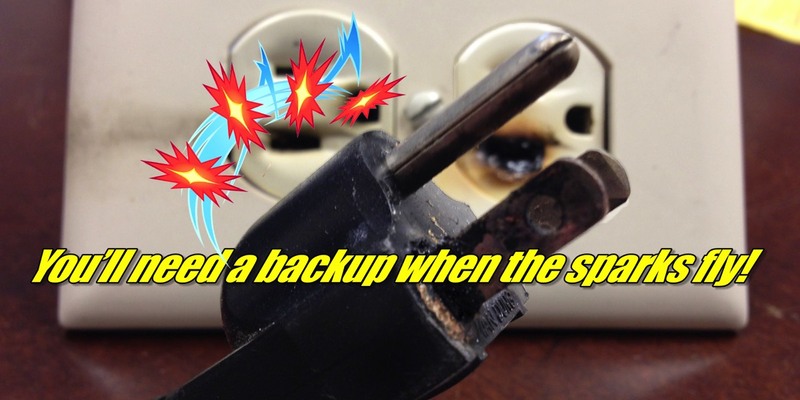 Electrical surges can affect the memory cells and integrated circuits. Filesystems on solid state devices can become corrupted, just as with hard disks. 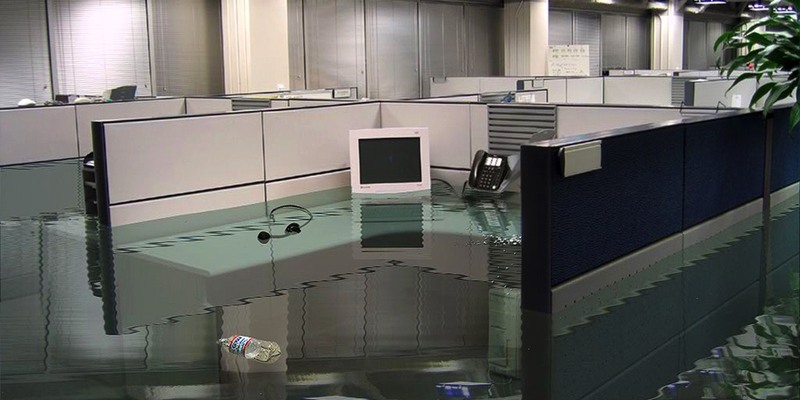 And SSDs can also suffer from physical damage such as liquid spills. It’s even more important to have a current backup of an SSD because almost all data recovery services are not able to work on them. Isn’t it amazing that your disk functions at all? It’s such a fragile device and there are so many things that can go wrong that you should be COMPULSIVE about backing up! Lesson 3: Why a Duplicate Backup? copy of your startup disk. In the event your startup disk fails, you can quickly start up your Mac from the Duplicate Backup and continue working right away. 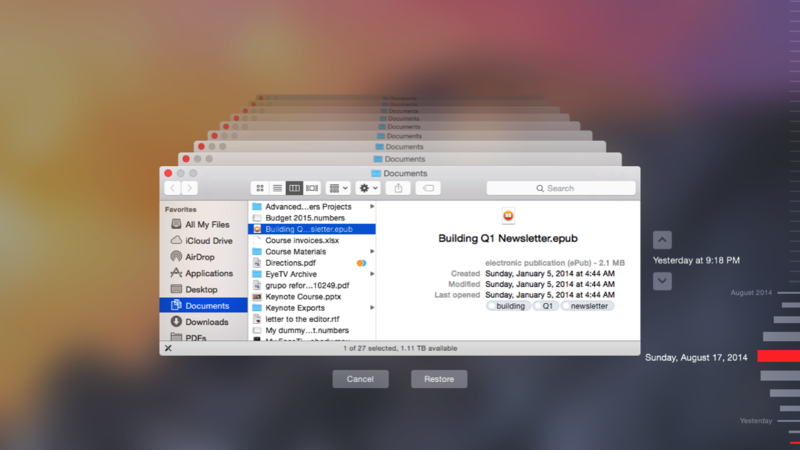 The Duplicate Backup is always as current as the last time you backed up. If you backed up on Sunday and your startup disk fails on the following Saturday, then you've lost what you did that week. Many TekBasics clients do a Duplicate Backup every night. We can set it up to run automatically and unattended. Lesson 4: Why a Versioned Backup? If you discover you accidentally changed a file, or deleted it, or it was corrupted or damaged, you can’t recover it from your Duplicate Backup because the file on the Duplicate would also be changed or deleted or damaged (after all, it’s a Duplicate). 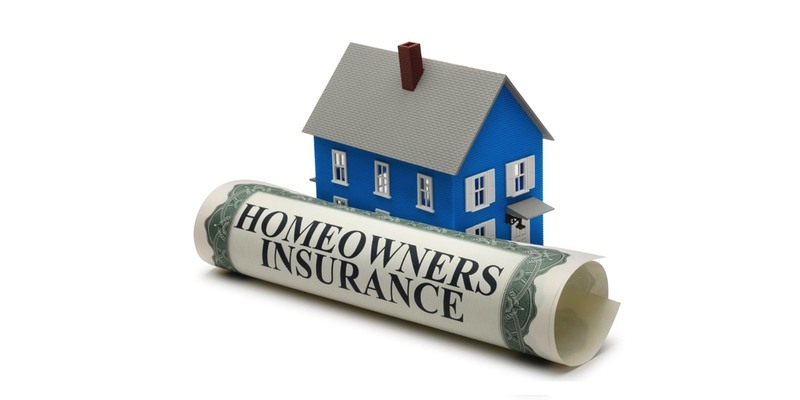 insurance against deleted and damaged files. 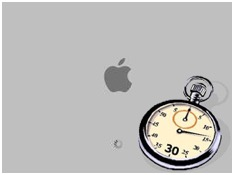 It enables you to 'go back in time' to recover the file before it was deleted or damaged. For example, let's say a few weeks ago you erased some files thinking you won't need them. Today you realized you do need those files. Your Duplicate Backup won't help because the files aren’t there. However, your Versioned Backup has backed up previous versions of your files over a long period of time and you can easily recover the files you need. 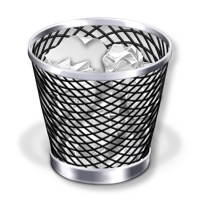 Time Machine is a feature of OS X that handles your Versioned Backup archive and automatically backs up files that change as you use your computer… hourly for the past 24 hours, daily for the past month, and weekly until you reach the capacity of your archive disk. To make room for new weekly backups the oldest weekly backups are automatically deleted from the archive. A larger archive will store more weekly backups, enabling you to go further back in time to retrieve older files. If you can’t find that favorite video that was on your computer 6 months ago, you’ll appreciate having a Versioned Backup that’s large enough to hold 6 months worth of your files. Call TekBasics to set up your Versioned Backup. Because it runs automatically your files are always protected. If you use a laptop we can set it up so it works over your wifi network so you’ll never have to remember to connect your archive disk. Notebook users may find it inconvenient to have an external drive plugged into their computer. 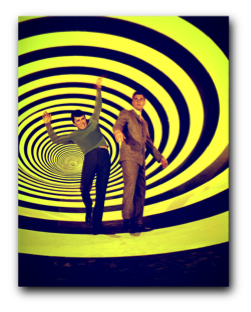 For this reason Apple makes it possible for Time Machine to back up to a Versioned Backup via a wifi network. One such device is called a Time Capsule. However, restoring a disk from a Time Capsule over a network can be painfully slow. Call TekBasics for a better solution. Be aware that this process can take much, much longer if the archive is on a network and is not directly attached to your Mac, such as a Time Capsule. Network speeds are no match for a disk that is directly attached to your Mac, such as a Duplicate Backup. Can’t afford to be without a computer for hours or days? A Versioned Backup CANNOT be used to start your Mac, and reconstructing your Mac’s startup disk from a Versioned Backup can take many hours or days. If you want to be back up and running in minutes you should have a Duplicate Backupa duplicate of your startup disk. 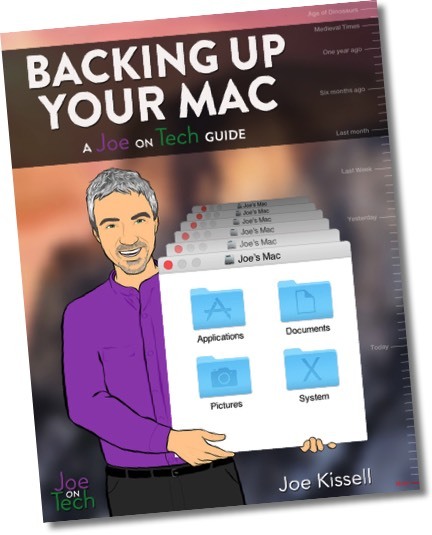 Simply restart your Mac from the Duplicate Backup disk. Lesson 5: Why an offsite backup? 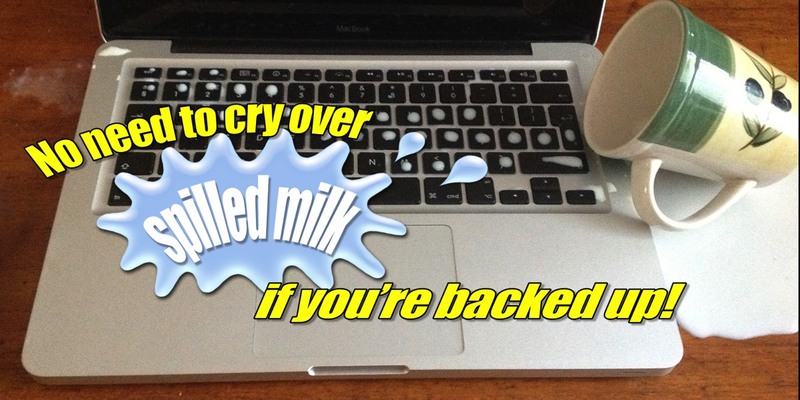 Hopefully you’re backing up regularly. And hopefully you have both a Duplicate Backup and a Versioned Backup. If you have both of these types of backups in place, unfortunately you still do not have a 100% guarantee that you won’t lose your files. 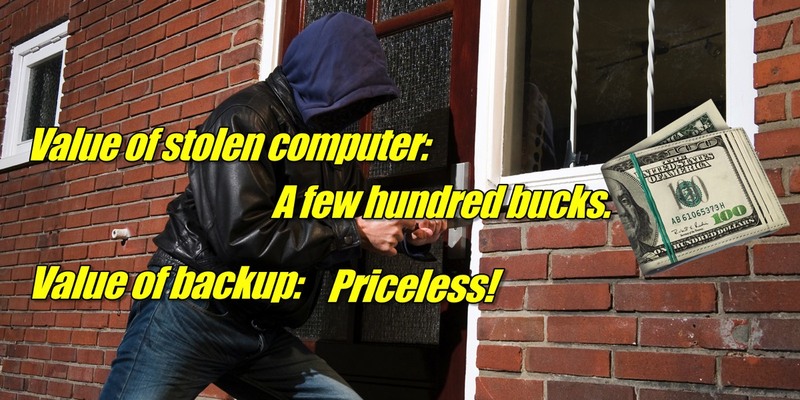 A thief can steal your computer equipment along with your backup disks. 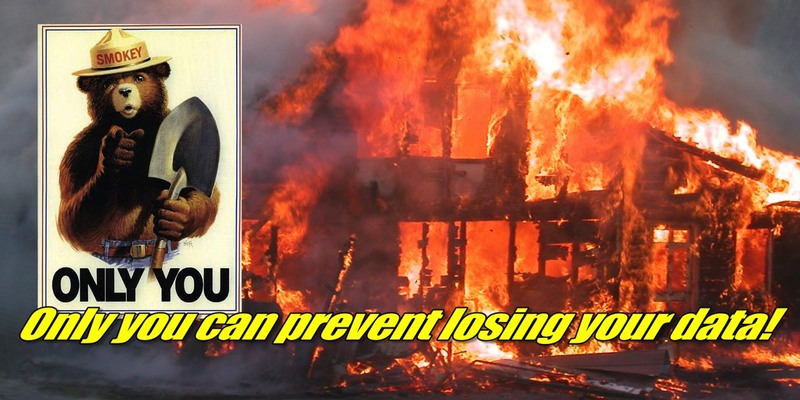 A fire can destroy all of your equipment. Or a power surge. Or a lightning strike. Or natural disasters such as a hurricane, flood or tornado. 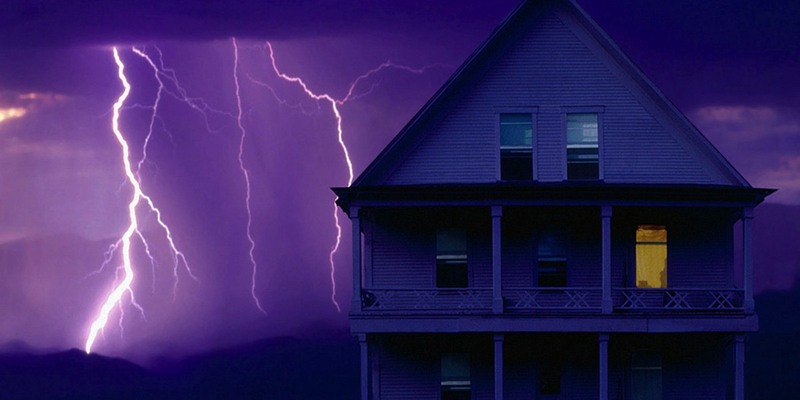 You’ve insured your house against these scenarios, so you know they can happen. 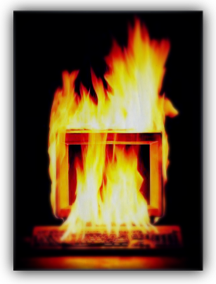 You can’t insure your files, so TekBasics recommends an offsite backup. 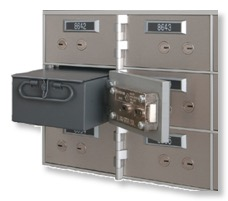 This technique involves rotating two Duplicate Backup disks, storing one at an off-site location such as a safe deposit box or a relative's house. Rotate the backups periodically so that both backups are kept up-to-date. Schedule the trips to the offsite location so they occur routinely. 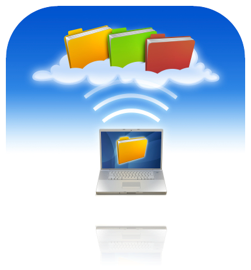 Online ‘cloud’ backup services are very convenient. A Versioned Backup of your data is safely maintained offsite in a professionally managed data center. 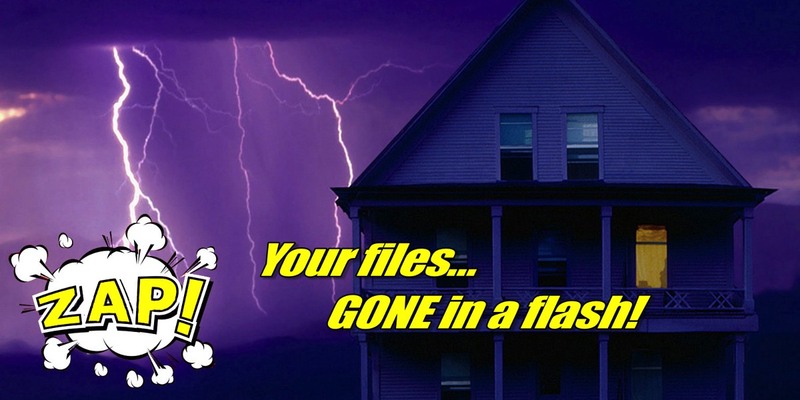 Your files are safe from storms, fire and theft because they’re located in a different location than your computer and backup disk. You don’t have to remember to connect and back up to your external disk. Even when you’re away from your external backup disk you can back up new files and access files that need to be recovered. 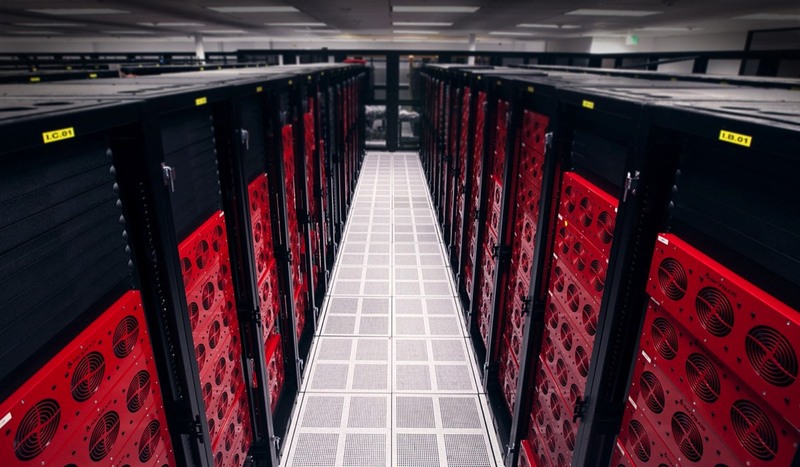 For these reasons and for its low cost and ease of use, TekBasics recommends Backblaze. 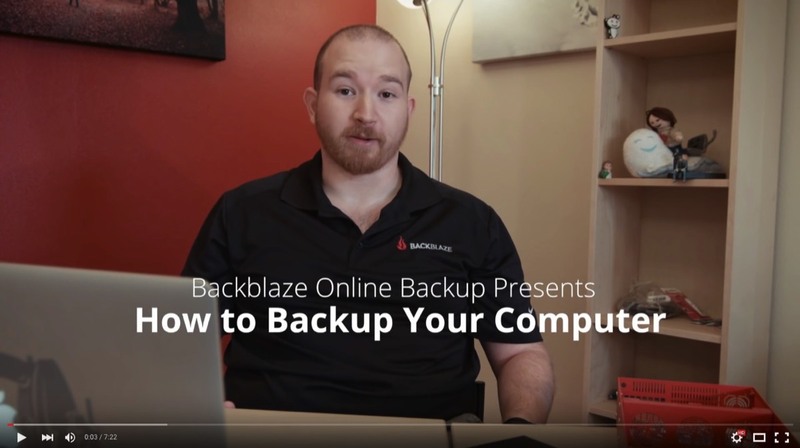 This 7-minute video explains when and where to use the types of backups discussed in this tutorial, along with the pros and cons of each. This is Important Stuff, so consider viewing it more than once. To discuss your backup needs contact TekBasics.